Usually, being able to say “I told you so” feels at least a little gratifying. But we don’t feel much satisfaction in being right about the return of market volatility. As we discussed in several recent quarterly commentaries, volatility is an inherent part of investing, but no one could have anticipated the roller coaster ride of the past few months. The S&P 500 dropped 8.7 percent in December alone, its worst December performance since 1931. Yet, by January, markets had rebounded significantly, regaining about two-thirds of what they had just lost. It can be challenging to stay the course during these times, and that’s why we speak so frequently about the dangerous allure of market timing. To truly time the markets, after all, you have to be right not once, but twice—both when to sell out of the market and when to buy back in. Investors’ recent behaviors certainly reflect the difficulty of such a feat. During December, they sold a record $83 billion of equity funds and ETFs, according to EPFR Global. This means they may have sold off their holdings at the markets’ lowest point of the year. To add insult to injury, they then likely missed out on January’s impressive gains. This means their attempts to time the markets amounted to a self-inflicted wound. Despite this data, many investors don’t think of themselves as market timers. They may feel this way because they aren’t constantly tracking individual stocks’ movements, hoping to exploit short-term price changes. Yet, many are tempted to sell out of their equity positions when the market is high in order to “sit out” the lows and hopefully hold onto more of their earnings. Although this strategy might feel conservative and prudent, it too is a version of market timing. It is still shifting a long-term plan due to beliefs about how the market will perform in the near term. Recent investor behaviors show how this kind of market timing can also significantly erode earnings. As a case in point: most of the gains in January were made over just a few short days. One might think that missing a few days of strong returns would not make much difference over the long term. 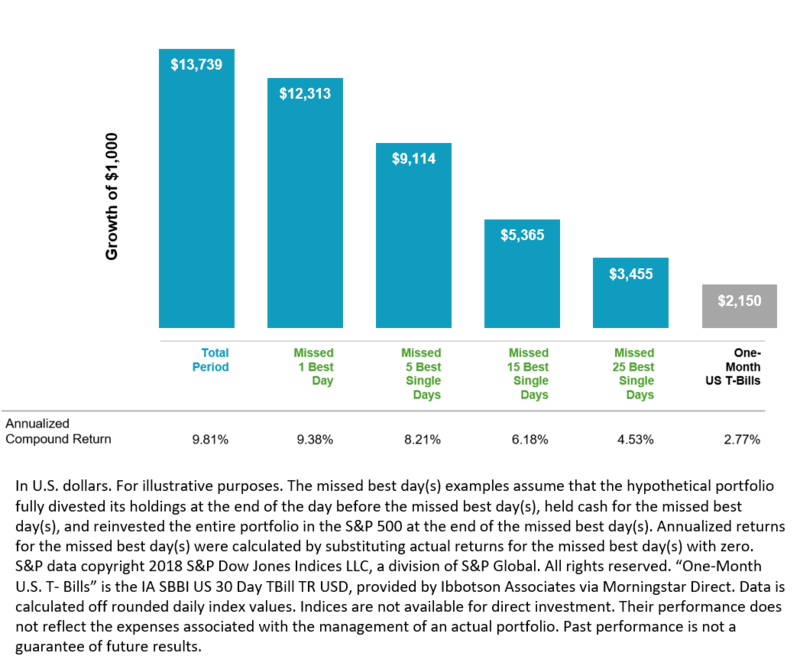 But, as illustrated in Figure 1, had an investor missed the 25 single best days in the U.S. equity market between 1990 and the end of 2017, their annualized return would have dropped from 9.81% to 4.53%. Such an outcome can have a major impact, a cumulative difference of more than 900%, on an investor’s financial plan. Another interesting aspect of the recent market volatility is that it highlights how the industry’s focus on year-end and even quarterly data sets can be misleading. Although the market dropped significantly at the end of 2018, it rebounded almost completely within the first few weeks of the new year. The following table (Figure 2) helps underscore how shifting your timeframe even a little can significantly affect your view of the markets. Below we show both fourth-quarter 2018 and first-quarter 2019 returns, very standard time periods to examine, compared with the returns from the more extreme highs and lows achieved in 2018. Viewed in this light, you can see why many investors chose to sell off a significant amount of their investments at almost exactly the wrong time. In December, the outlook felt very bleak. But had investors been able to see that markets would rebound so strongly, so quickly, then of course they wouldn’t have sold. Yet, such a possibility was hard to envision on December 24. The pronounced market volatility of the past few months is why we emphasize the need to stay the course and stick with a long-term investment strategy. One important consequence of these up-and-down markets is that they affect target portfolio allocations. When markets are volatile, portfolios can quickly drift away from their target allocations. This makes portfolio rebalancing—selling outperforming asset classes and buying those that have underperformed—all the more important. As always at Truepoint, we monitor all of our client accounts for rebalancing opportunities so that their portfolios stay properly aligned with long-term goals and strategic allocations. Volatility also provides valuable opportunities for tax-loss harvesting. This process involves selling a security that has experienced a loss. When you realize—or “harvest”—that loss, you can then offset your capital gains and your income, which in turn can lower your tax bill. You immediately replace the sold security with a similar one so that you can maintain your target allocations. For example, imagine John and Lucy invested $1000 in an S&P 500 ETF on December 1, 2018. By the end of the month, let’s assume their investment was worth about $720—a $280 loss. If they wanted to “harvest” that loss, they would sell the ETF so that they could claim a $280 capital loss, and then replace it with a roughly similar strategy. Lucy and John could then use that $280 loss to offset any other capital gains they made during the year. In addition, if their capital losses exceeded their capital gains for the year, they could also use their losses to offset their income and thereby lower their income taxes as well. Any losses taken, but not used in a given year, are also eligible to “carry forward” into future years. Thus, tax-loss harvesting offers many powerful ways to decrease your tax bill. Of course, tax situations vary significantly from family to family, just as tax-loss harvesting opportunities differ across client portfolios. Therefore, no two portfolios will benefit in exactly the same way, but the practice can help alleviate investors’ tax obligations. The problem with market timing is that even though investors know it’s a poor strategy, it can be hard to resist the practice when the market feels like it’s crashing—or when it feels like everyone else is getting rich. A good advisor will not only craft your investment plan but will also help you adhere to it. While activities like rebalancing and tax-loss harvesting can be time-consuming and complicated to manage, the value added over the long term can be substantial. At Truepoint, we are committed to helping our clients meet their financial goals. But, more importantly, we also want to help them rest a bit easier, knowing that we can help them take advantage of market volatility, without getting swept up in the hype.